Exploring Madrid – La Latina! If you are planning on going to Madrid, there is a neighbourhood you absolutely need to visit. It is located in the old town of the city, has some of the most beautiful medieval streets in the world and hosts the best Tapas bars in the Spanish capital. Its name is no other than La Latina. La Latina is one of the most genuinely authentic neighbourhoods of Madrid. On Sundays, the biggest open-air flea market in Spain is held in its grounds – El Rastro de Madrid. Whether you are looking for a new painting to decorate your walls, browse rare books, vintage clothes or even buy a new pet, you can be sure that you will be able to find it in El Rastro! 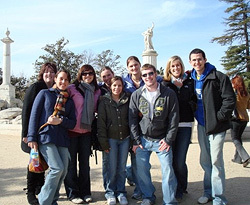 I can confidently say that studying Spanish in Madrid was the best decision of my life! There was so much to experience in this miraculous city that I found it difficult to decide what my after-class activities would be every afternoon! Thankfully, though, everything (including the school) was easily accessible by the very efficient Metro system in Madrid. One of the first few days that I was in Madrid I decided to enjoy the beautiful weather outside by exploring the park that is just minutes from the school… El Parque del Buen Retiro (Park of the Pleasant Retreat). This park was magnificent – I spent so much time there! It had everything imaginable to enjoy a sunny afternoon…from beautiful gardens and peaceful little café’s to artistic, amusing street performers and a pond filled with people paddling rowboats. It was the perfect retreat for me because I would go jogging there in the cool of the early morning. In the afternoons I could chill out there and sip on a refreshing drink under the café terraces. One day I even had my fortune told in the park (which left me feeling quite optimistic afterward). Why I can’t wait to go back to Madrid! There is just one word I can use to describe Madrid – Perfecto! It is an amazing capital city with so much great history and culture – there is always something to do! I really enjoyed studying in Madrid because I got to watch the bustling city go about its business – try walking around Gran via mid-day – just a crazy amount of energy in the air-so many people around, shopping, eating… walking… being a city girl myself I fell in love with it! I have so many fabulous memories of the people I met and the places I saw in Madrid. I spent many afternoons after class eating yummy tapas with my friends before we studied again. My favorite tapas restaurant was an amazing place called “ 100 montaditos ”. It is so cool there – they sell tiny little sandwiches, with whatever you’d like in them! I enjoyed tortilla de patatas in mine! All for the bargain price 1€ each! The first time I went there I ordered just one, thinking that it would be a full size sandwich. I didn’t realize that montadito translated into small sandwich! When I was looking for a summer course in Spain to continue with my Spanish lessons, I didn’t know where to go. Should I look for a place with a beach or should I (considering that I would go for a month) go to a big city where there would be more to see and discover? 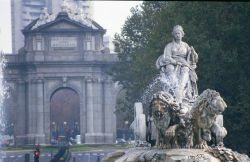 I decided to go with the second option and spend one month of my vacation at the Madrid (Retiro Park) school. I don’t regret my choice at all, as there are really so many things to do in Madrid that you don’t miss the sea at all! 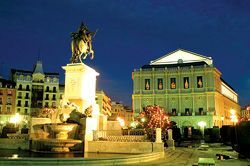 If you’re like me and you’re not much of an urbanite, then you may not think that Madrid is the ideal place to study Spanish….however you’d be wrong – very wrong! My time in Marvellous Madrid!!! Honestly? Okay, as a dedicated Heat magazine reader, my immediate thought when I planned my course in Madrid was… I wonder if I’ll bump into Posh and Becks. I never did get to meet them, but fortunately I did find that there is sooo much more to Madrid than shopping (Posh) and football (Becks)! If you love art you will go crazy in the Prado. If you are a foodie you will be in manchego and jamon paradise. If you love history you can trek museums ’til you drop. But for me, one of my biggest raves is the nightlife – absolutely incredible. With the largest number of bars per capita of any European city, it has to be among the best in the world! In fact, I found that one of the biggest problems with going out in Madrid was deciding where to start! Fortunately, I got on wonderfully with the other students that I shared my apartment with, one of whom had already been in Madrid 3 months and had managed to put together a shortlist of the most fabulous places in Madrid!